Castleford Tigers will not be going to Wembley this year after crashing out 40-14 at the sixth round stage of the Ladbrokes Challenge Cup to Hull FC at the KC Stadium. The game was a lot closer than the final score suggested as Cas hit back from 16-0 down to 16-14 and were only two behind going into the last quarter, but it was Hull who finished the stronger to earn their place in the quarter-finals. Hull also started the better and were ahead within four minutes, winger Curtis Naughton squeezing over in the corner for a disputed try as Cas thought he may have put a foot in touch. Two more tries followed from Naughton and Mickey Paea with former Tigers player Marc Sneyd kicking two goals to have the hosts 16-0 up after just 17 minutes. Castleford dug in, however, and after improving their defence they finally got some joy when winger Ashley Gibson went over for a try that went unconverted. It stayed 16-4 to half-time, but within eight minutes of the second period the Tigers were right back in it after scoring two tries. First, skipper Michael Shenton sent winger James Clare over for a try goaled by Luke Gale then Mike McMeeken, on his return from injury, scored after Liam Finn’s high kick had been knocked back by Jake Webster. Gale could not add the extras to the second try, leaving Cas two points short and they were not to get any closer. 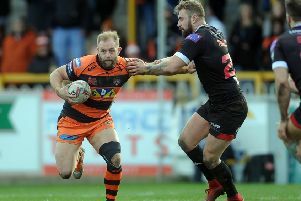 The game was held up for a lengthy spell with former Tigers player Jordan Thompson having to be stretchered off and on the resumption it was nip and tuck for a spell before Hull came up with a crucial try on 62 minutes, full-back Jordan Rankin finishing off a good move. Sneyd could not convert, but added a penalty goal 12 minutes from time and effectively it was game over at 22-14. Castleford’s efforts at staying in the contest left them tired in the closing stages and the floodgates opened as in the last eight minutes Naughton completed his hat-trick, Rankin got his second try and Kirk Yeaman scored with the last move of the game to give the final score a flattering look for Hull. Scorers - Hull: Tries Naughton 3, Paea, Rankin 2, Yeaman; goals Sneyd 6. Castleford: Tries Gibson, Clare, McMeeken; goals Gale. Hull FC: Rankin; Naughton, Talanoa, Yeaman, Michaels; Pryce, Sneyd; Watts, Houghton, Paea, Minichello, Sa, Ellis. Subs: Abdull, Thompson, Green, Whiting. Castleford Tigers: Tansey; Gibson, Webster, Shenton, Clare; Roberts, Gale; Lynch, Milner, Bailey, O Holmes, Moors, Massey. Subs: Millington, Jewitt, McMeeken, Finn.